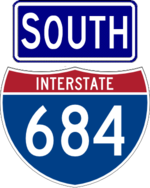 I-684 connects I-287 to I-84 east of the Hudson. Signage for I-684 extends a little past I-84 to the interchange with US 6 and NY 22, with the freeway becoming two-lane NY 22. The road was planned as a realignment of NY 22 (and was signed as such during construction), then part of I-87, and finally I-684 when I-87 was moved onto the Thruway west of the Hudson. The short dip into Connecticut is maintained by NYSDOT. Maximum Height 9' - 2"